Home security becomes important especially in times when people are spending more and more time outside of it. Some owners may need a way to check up on their home even while they are at work or away on a trip. Such needs call for a surveillance camera set up that home owners can always check themselves. Panasonic has its own version of a personal home security camera set up in the form of the Panasonic BL-C230 Wireless Network Camera. This real full motion video network camera is wireless using the 802.11b/g wireless technology. This wireless network camera can record up to 30 frames per second, has a digital zoom and also features a 3 LUX color night view mode. It also features sensors that detect body heat, sound and motion. What makes the Panasonic BL-C230 Wireless Network Camera quite convenient is that home owners may be able to access it through the Web via a secu8re and personalized website. Captured images can also be sent via email. 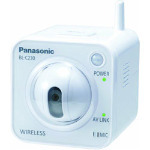 The Panasonic BL-C230 Wireless Network Camera can be checked out at the website. The network camera itself may cost US$300. Good camera. Not expensive for this class of cameras.